With its industrial good looks, our Bermondsey Wall Lamp looks marvellous with its wonderful aluminium head and base contrasted with smooth oak hinged arm. 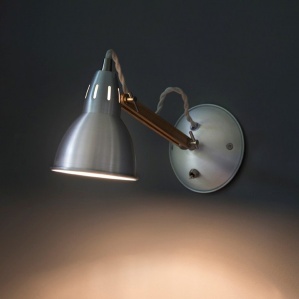 As well as looking every bit as stylish as overhead lighting, the Bermondsey Wall lamp is wall mounted and has the added advantage of enabling you to direct the light within the room wherever you need it most. Style and substance - we're sure you'll agree.